EX = Explore and Experiment. These are two things you should be doing with your smartphone all the time! Just when you think you can’t possibly find anything new your phone can do, a friend will tap a button that makes magic happen and you’ll ask, “How’d you DO that?” One of those things for me is the fun, speeded up videos that are popping up on Facebook all the time. I understood the iPhones ability to take Slow Motion video, but in one of our smartphone photography classes a student played with the Time-Lapse setting instead and showed me a video of me walking around the classroom looking like an old Keystone Cops movie! 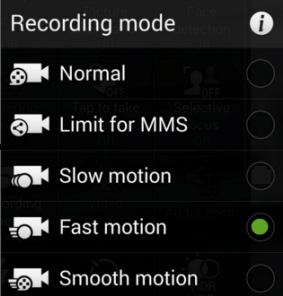 So, that made me explore my phone a bit more, the Samsung Galaxy S5 and I found a setting for Video Recording Mode called Fast motion. Next time you get out your phone to take a picture, explore the settings – do you find a Time-Lapse or Fast Motion setting? If so, try it! You can always delete the results, but who knows? You may just really like it! Whaddaya say? Published by MrsGeek, in Blog. Tagged with #GeeksWhoTeach, Android, Droid, google, iPad, iPhone, iPhone Time-Lapse, Samsung Fast Motion Video, smartphone cameras, Smartphone photography, Smartphones.